Photo Galleries...it is what the customers want to see!! Photos are truly worth a 1,000 words and this is the show and tell of your company's products and services. 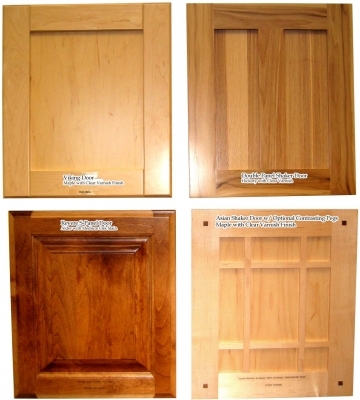 Display your gallery of finished products and construction or design details. You can inspire your web visitors by showing them some new design styles for the kitchen, bathroom, entertainment centers and offices. This is your opportunity to put your best foot forward! Your kitchen photos could be the motivation for a homeowner to renovate or building a new home. Potential customers are looking for lots of ideas: new functions, interior color schemes and creative designs. Remember to zoom in close on those photos to show more function on the storage, the lower or recessed countertops and even how the appliances fit in to the space. If you are going with three or four separate iPhoto galleries you could put crown molding shots in the finishing and millwork section. Photo Tip: If you are planning on snapping your own photos, there is a trick to taking spectacular kitchen photos. In a kitchen or bathroom your camera will want to adjust to the outside light streaming in through the windows. This makes for a great window shot but your cabinetry will likely be under exposed. Bathrooms are the second most important room in the home and can show so well when it is well designed. We suggest you seriously consider a separate photo gallery just for your bathrooms. In the Bathroom Photo Gallery panoramic photographs make more sense than in the Kitchen Photo Gallery. In the bathrooms you are typically showing an overall mood and interior design of the room. There is typically not as much extra function to demonstrate as in the Kitchen. Photo Tip:Try to remove distractions from the picture by cleaning up the top of the vanity. A vase of flowers, a basket of towels and a soap dish are often enough to give the bathroom some design flare without taking the focus off the cabinetry. Show the crown moldings, the dove tail drawers, the sanding, the spray booth and the CNC router. Here is where you can show and tell them that their kitchen will be made locally by caring, creative hands. You can even address some of your "green" incentives for the ever growing list of concerned buyers wanting to be good environmental stewards. Photo Tip: Shop workers often dislike being photographed. Depending on their level of resistance, you might consider offering a small incentive to allow their picture to be taken. Whenever possible try for a genuine shot but you may need to have them pose. The finishing styles & colors gallery is where your active client can determine their colors, finishing accents, door styles and moldings. A simple gallery of doors in the various colors could suffice but where designs are intricate and detail critical you might want to also include an enlarged photo. Take care to ensure that the photographs are true reflections of the real color so each photo may require some color balance to get it right. Photo Tip: Taking a photo of a flat surface can be tricky depending on the light in your shop or showroom. Try to lay the pieces flat - either against the wall or on the floor. If you lay them on the floor you will want to stand directly over them to reduce glare. Photo Gallery - Your business plan (i.e. are you targeting the high end retail market or mass manufacturing for wholesale?) will help determine whether you should choose just to display a parts photo gallery or show the more inspirational collage of glorious cabinetry you design and craft. If you take advantage of this CMO special offer as part of the package you would receive for free one photo gallery installed on the page of your choice. We do recommend that you collect professional photos of your creative work. Panoramic pictures of a full kitchen are nice and useful at times but the close ups showing great detail are important too. Note: CMO can arrange for a professional photographer to visit your shop or clients' homes in most North American cities for approximately $125 per home. Final thoughts: How much are you spending on marketing? Using retail business figures f you are you running a $1+ million business you should be considering a 20-25% budget on advertising. While your cabinet shop may not require marketing to this extent please remember that your web site is your storefront to the world and is open 24/7. High quality photos will instill confidence in your new prospective clients that they are going to receive the quality they pay for and will even consider paying higher than the competition to receive that quality. Poor quality photographs may actually be worse than no photo at all because it erodes that confidence in quality. It mostly boils down to whether you are wanting to market a premium product or compete against the other mass production shops selling their products wholesale.